Ok, well not so much here, but for those of you who are lucky enough, this should be about the time that everyone is overloaded with fresh zucchini! I have been eating tons of produce lately because well (besides what I said yesterday) it is so freaking good! We went to the little farmers market here this past Saturday and I got a few things. The farmers market is really small and I was really going to just check things out. Surprisingly, I think it was a little over priced. Especially since it was all local. Oh well, I found a pretty good deal on zucchini, eggplant and corn, so I considered it to be a successful outing! So, I have been reading this blog (Sarah at LovIN My Tummy - who will no longer be blogging, but she deserved the credit) quite a bit lately. I think we think a lot alike when it comes to food and I like the look of what she eats (maybe because we eat the same things?). Anyway, she has been making these zucchini chips lately and I was intrigued. So, I thought I would give them a little try. I sacrificed one of the smaller zucchinis for the experiment because I thought that I was the only one that would eat them whether they were good or bad. Seriously, I don't through food away! Well, even though I don't think it is overly economical for me, due to my lack of gardening skills) to make them on a regular basis (unless there is a massive sale on zucchini) these things were so good! The illustrator, the little one and I kept going back for more! They were so good on my salad with hummus for lunch! They were nice and crispy...and a little sweet and salty! 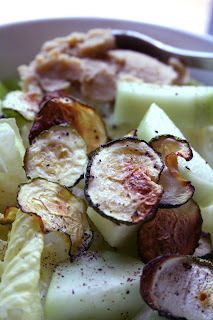 So, if you have an abundance of zucchini...get on it and try these out. You won't regret it! Preheat the oven to 300 degrees. 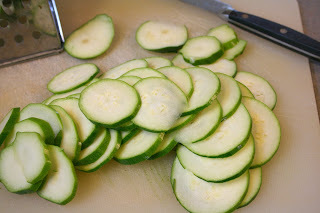 Slice the zucchini thin. Make sure you slice them very thin. I tried to use the slicer side of my grater, but I did not like how it was slicing. I ended up doing it by hand. Bake for about 40 minutes. Keep an eye on them in the last 10 minutes so the smaller ones won't burn. They should start to brown and look crispy. When they cool, they stiffen up. 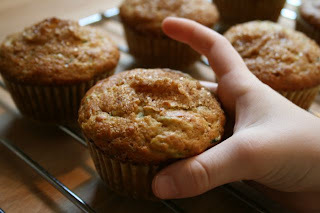 Also, this is one from a while ago, but I highly recommend it...Zucchini Muffins! Now THOSE look fabulous - holy yum! 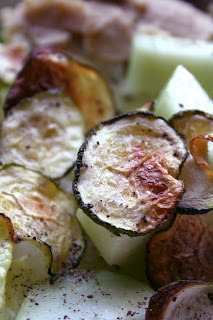 I made the zucchini chips last week and oh my gosh I loved them! So much in fact that I have had them 4 times in the last 5 days! Obsessed? Maybe.